XIANGNING, China (AP) — Frustration mounted at a flooded mine in northern China as anguished relatives of 153 workers trapped underground briefly turned violent Tuesday amid revelations that warning signs of a flood went unheeded. The anxiety of the families and co-workers of the trapped miners was exacerbated by what they felt was the unresponsiveness of those in charge of the mine's operations and rescue efforts. Their anger reflects the deep distrust of many ordinary Chinese toward officials seen as corrupt and indifferent. Even as 1,000 rescue workers at the Wangjialing mine in Shanxi province were tunneling and laying pipes around the clock to drain away water, hopes dimmed as rescue efforts reached a third day with no communication with those trapped. It could prove one of the most deadly mine accidents in China since a coal mine flood in eastern Shandong province in August 2007 killed 172 miners. The disaster is a setback to recent, significant improvements in the dire safety record of China's mining industry, the world's deadliest, claiming thousands of lives each year. 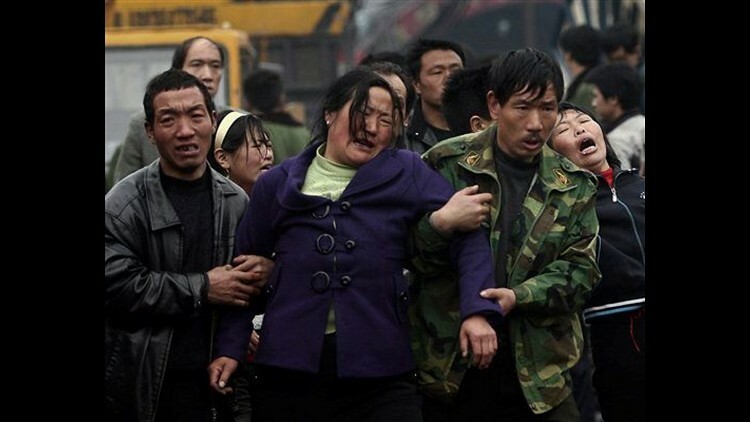 Family members, many of whom had just arrived at the Wangjialing mine after rushing from their home provinces, milled around the site demanding explanations for the flood, and complained they weren't seeing water being pumped out. Officials insisted they were clearing water, but were hampered by intermittent electricity cuts. About 50 miners' relatives surged onto the office grounds and as the shouting grew louder, one man picked up a shovel and smashed a window. The crowd calmed as officials emerged and started talking to them. At the entrance to a shaft, six women fell onto the black mud and cried: "Please help," as rescue workers stared with solemn, soot-covered faces. "We need to see some action to make us feel like they are doing all they can," said Long Liming, brother-in-law of one of the trapped miners. "They have the materials, the pipes are here, why aren't they getting to rescuing people?" China's State Administration of Work Safety said 261 workers were inside the Wangjialing mine when it flooded Sunday, and 108 escaped or were rescued. The 153 workers who remained underground were believed to be trapped in nine different places in the mine, which was flooded with up to 5 million cubic feet (140,000 cubic meters) of water, state television said. Officials have yet to declare the cause of the accident, but experts said it was likely that miners broke into the old shafts or pits of derelict mines that had filled with water. A Wangjialing miner said workers had warned of water leaks in the underground shafts as early as last Thursday — but were ignored. "They told leaders, but nothing was done about it," said Yang Shengcai, 48, a miner from Hebei province. "They would call and say, 'There's water here,' but still nothing was done. I don't know why. This kind of thing is up to the leaders to handle." The Beijing News reported Tuesday the leaks were so bad that before the accident, workers asked for pumps to clear some of the pooled water. It was unclear if anyone was still alive in the shafts, some of which extended a half-mile (one kilometer) into the earth. Rescue workers said there have been no signs of life or communication with people underground. Tang Yinfeng, a migrant worker from the southern province of Hunan, said two of her younger brothers were trapped underground. "I want to bring oxygen tanks down," said Tang, 49. "I want to save them myself." State media reported rescuers have drilled 65 feet (20 meters) of a planned 400-foot (120-meter) water diversion channel they hope can clear water away. Work had yet to start on a second, 980-foot (300-meter) tunnel leading from the ground straight down to the affected shafts, because engineers were uncertain where to start drilling. At the site, workers unloaded heavy metal pipes into a work area near a shaft where they were measured and cut. Some rescuers in bright orange suits strapped on oxygen tanks in preparation for going underground. On the other side of the site, black water gushed out of a few plastic pipes leading out of the mine. Authorities were also worried that gases from the abandoned shafts may have flowed into the mine, bringing new dangers such as explosions or poisoning. "The top priority now is to speed up pumping the water and achieve the goal of saving people," Luo Lin, the director of the State Administration of Work Safety, told China Central Television. "In addition, the drilling needs to be done faster too." Accidents killed 2,631 coal miners in 2009, down from 6,995 deaths in 2002, the most dangerous year on record, according to the State Administration of Coal Mine Safety. That means on average more than seven miners die daily, down from 19 in 2002.